It’s at times like this that leadership is most necessary. But today, July 8, 2016, it seems leadership is mostly missing. An outbreak of gun violence and bloodshed has put our community and our nation on edge. On this narrow edge, we could fall in either direction: toward more violence or toward a better way of life. Let’s be clear. The attack in Dallas and the police shootings in Louisiana and Minnesota, all within the last 72 hours, are just the latest, rawest examples of a current in this country that goes back further than Trayvon Martin, Alton Sterling or Michael Brown. Sam Dubose before he was fatally shot. But these times feel even more divided, even more angry. That’s why we need strong leaders who can speak out for, and guide us to, a calmer, more peaceful, prosperous time. The voices of anger and division are drowning out the voices of community and reconciliation (wherever they might be). Donald Trump’s angry rhetoric of wall-building and immigrant-banning saturates the media. It has an impact. The president has taken needed equipment away from the police. Do you think they could have used armored vehicles from military surpluses. Sheriff, do you take any responsibility for your campaign of suspicion and fear against Hispanics? Has that helped fuel the anger? Sickening news out of Dallas. A horrific day for America. Cops are the good guys. Anti-cop rhetoric fueled by the American left must stop. True leaders work to bring their communities together in a common purpose. They don’t run to their corners and prepare their political talking points. They step up in the most difficult of times to speak and act courageously. That sounds Pollyanna-ish, doesn’t it? But if we believe it, then we should demand it of our leaders. That can start with an Oval Office speech from the president of the United States. It could continue with a courageous, rational debate and then effective legislation on assault weapons, the kind of guns used by the attackers in Dallas. We’d like to see our representatives move beyond thoughts and prayers to courage, action and relevance. Congress, look around at our country, at your communities. We’re beset by terrorism, violence, hate, poverty and drugs. And Capitol Hill is ramping up investigations about email? Steve Chabot, Brad Wenstrup, Tom Massie, Warren Davidson, Sherrod Brown, Rob Portman: speak up and tell us how you plan to spend your time in DC. Speak up for peace, not politics. Give us some actual legislation that will make lives better, that will promote peaceful communities and that will serve as bridges, not barriers. That's what courageous leaders do. We have an example to look to. We have streets, statues and a holiday to remember Martin Luther King Jr., and in this time of violence and anger, we would do well to also remember his words and actions. 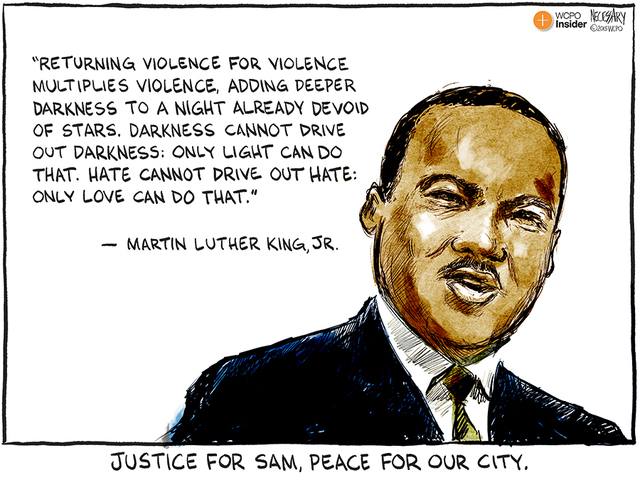 King’s mantra was nonviolence. Even in the face of beatings and attacks by police, he and those who followed him stuck to their principles. That’s how a leader leads. Where do you stand? For anger, violence and hate? Or for justice, peace and nonviolence?